Czech authorities have accused members of an alleged crime group of EU and Vietnamese nationals of trading animal products made from species protected by the Convention on International Trade in Endangered Species of Wild Fauna and Flora. They allegedly sold tiger stock used in traditional Chinese medicine for almost US$100 a litter as well as tiger’s skin for $2,000, Czech authorities reported back in July. The popularity of the products were spurred on by traditional medicine users and small zoos that allow young children to play with baby animals, including big cats. Once the animals reached a certain age they’d be sold to these groups. The investigation, called Operation Trophy according to Science Alert, led authorities to a facility with freezers full of rotting carcasses of the world’s big cats, tigers, lions, and cougars. They found that a shed on the property held the body of a recently killed tiger with a bullet hole in the neck to ensure the fur remained safe and undisturbed, media reported. A cooking pot stood close that held various bones of previously killed animals. “I have been working for the inspectorate 25 years … but the situation there was really horrible. If you can imagine: an old freezer, without electricity, full of meat and dead bodies, in the garden for two years. Absolutely incredible,” said Pavla Rihova, lead environmental inspector during the raid, according to the Guardian. The raid was one of 10 in Prague and in Bohemia and came after Czech authorities discovered that an organized crime group from the Czech Republic and Vietnam were illegally killing big cats to sell on the Chinese traditional medicine market, according to the outlet. Czech authorities said at the time that they had confiscated the body of the tiger, 4 skins, tiger claws, and tiger wine and bouillon cubes. The investigation began in 2013 when EU customs officials started finding tiger bones hidden in various objects leaving for Vietnam. Authorities also found tiger wine and broth coming from the Czech Republic. In 2015 Czech environmental inspectors started an inspection of the captive tiger population, the Guardian reported. Authorities found inconsistencies in the documents like multiple exports of the same supposed tiger, lack of death records, or a complete vanishing of the animals. 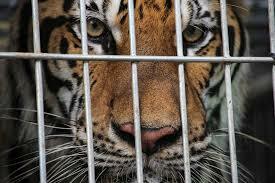 Moreover, “in zoos or in the wild, tigers can live to well over 20 years. In the Czech Republic’s private breeding facilities they were consistently dying before they reached five,” the Guardian wrote. Investigators eventually suspected Ludvik Berousek of involvement in the crime ring. Berousek’s family are not only members of a Czech circus but also happen to run the largest tiger and lion breeding facility in the country. Two years later they found that Vietnamese trader, Le Xuan Vu, was at the heart of the orders. Berousek would then send the animals to taxidermist Milos Hrozinek who along with Vu would butcher the animals. The three men have been charged with illegal killing and trade of a protected species. Berousek, the Guardian reported, still operates the facility. “Without some registration, some documents, the registered movement of animals from one breeder to another, you cannot have an overview,” she said.